Q4: What is the Role of the Horse in Equine Therapy? It depends on your approach and who you certify with, but approaches broadly fall into two categories. One is of the ‘horse/ animal as a tool’ who is used to bring insight, learning or healing to the client. The other (followed at Healing Hooves and by EFW Canada) is of the ‘horse/ animal as a sentient being’ who you partner with in this work to jointly facilitate the potential for that insight, growth or healing in the client. The extent to which you can draw upon the potential benefits of engaging in an animal assisted approach. Note: If you are unsure of any of the terminology or acronyms we use here please refer to our earlier blog post where we define and review common Equine and Animal Assisted Therapy terms for you. Please also note that while we primarily refer to equines and EFW in this blog post, much of what we are saying applies equally to other species and to the broader field of AAT. 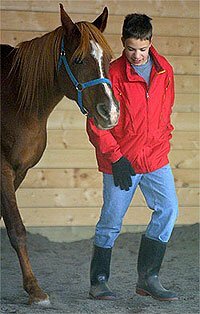 Ethics around the impact of this work upon the horse (and other therapy animal) have always been important, and over the past decade awareness of this factor has greatly increased. The ‘horse as tool’ approach still exists but is not usually defined this way and even then, awareness of the impact of this work upon the horse has increased. 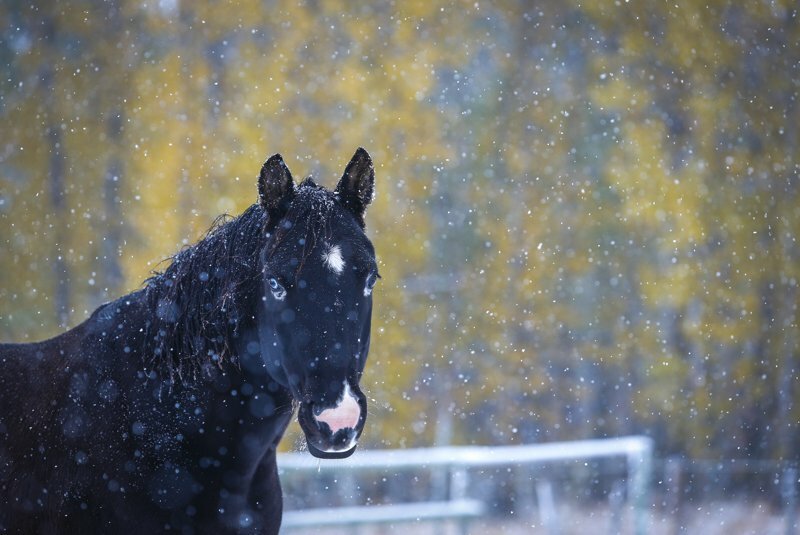 Increasingly programs are adopting the ‘Horse/ Animal as Sentient being’ philosophy advocated by EFW Canada and several other professional organisations in the EFW and AAT fields. The aim of this post is to explore what this means, and how it impacts both how we treat our horses and how we work in the EFW and AAT fields. ‘Sentience’ is defined as being capable of experiencing and feeling emotion. This usually partners a belief in the need for animals to be allowed to safely express these emotions. 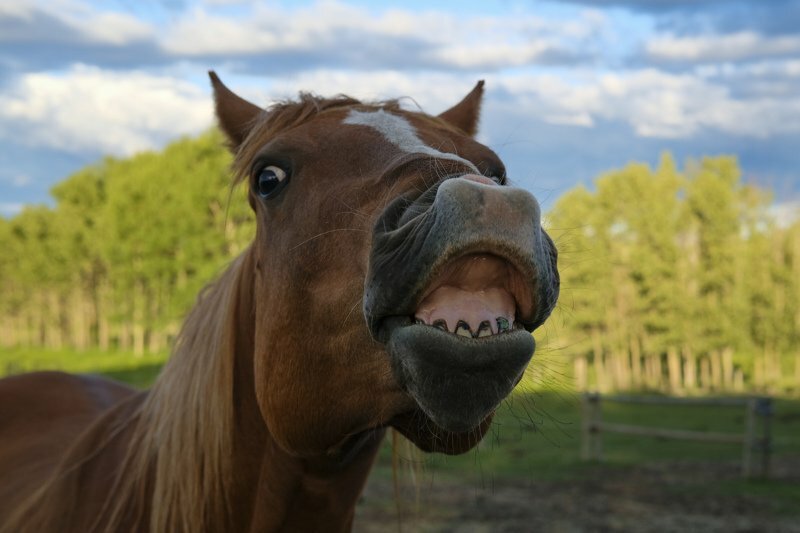 “Equines have their own perceptions and emotions, and can also attune themselves to the presence and feelings of others. Through their remarkable sensitivity, perceptiveness, and intuition equines are able to offer valuable feedback and information to clients. It is crucial that they are able to express themselves spontaneously and freely through their actions and reactions when working with clients. 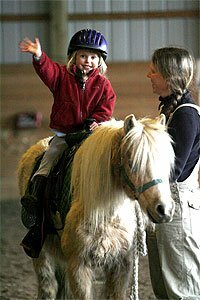 This area of discussion is one of the most critical to consider early on in your explorations of the Equine and Animal Assisted Therapy journey. Whether you are exploring Equine Therapy or AAT as a potential client, considering it as a new career, or adding horses or other animals into your existing practice, we highly recommend that you ask yourself what you believe about the emotional lives of animals, and how you would like to work with animals for your, your clients’ and your animals’ well being. 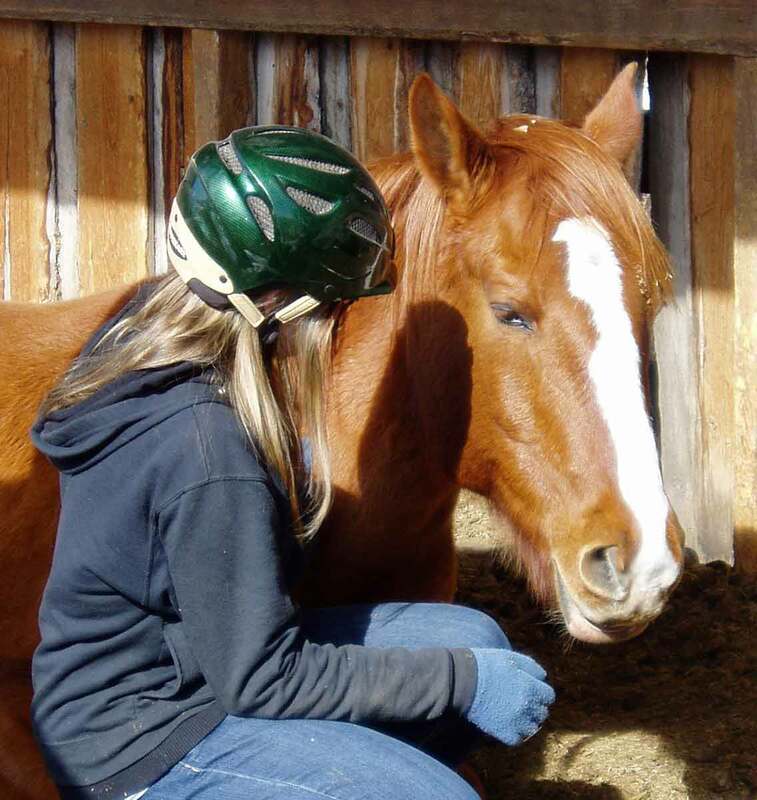 How we view the horse in equine therapy (or the animal in animal assisted therapy) is both impacted by and influences almost all aspects of the work and the human animal bond. It sets the tone both for how the horse is treated and cared for, and for how we are able to consciously draw upon and benefit from the horses’ wisdom and contribution to this work and relationship. How Does the “Horse as Sentient Being” View Impact our Approach and the Potential Benefits of Equine and Animal Assisted Therapy? Simply being with horses in a healthy environment and relationship is good for us: An ever growing body of research indicates that animals are good for our physical and emotional health, well-being and development. For example, studies show that children who have positive contact with animals tend to have higher self-esteem, and are more empathetic and nurturing. Further research shows this bond is especially powerful when we are feeling vulnerable, stressed or are facing challenges, loss or major change. 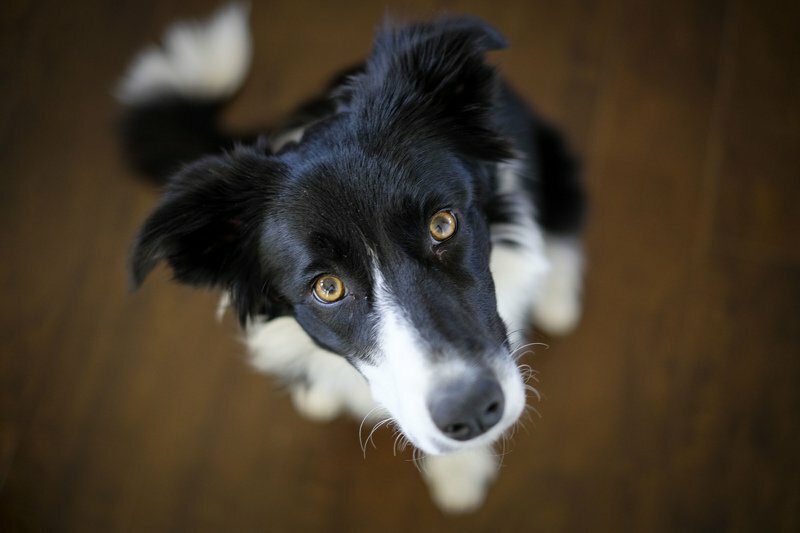 Animals can help us express emotions, seek social support and problem solve. A key pre-requisite for many of these benefits is the existence of a positive attachment between the human and animal. I would argue that this is best achieved when we value the animal as a sentient being. 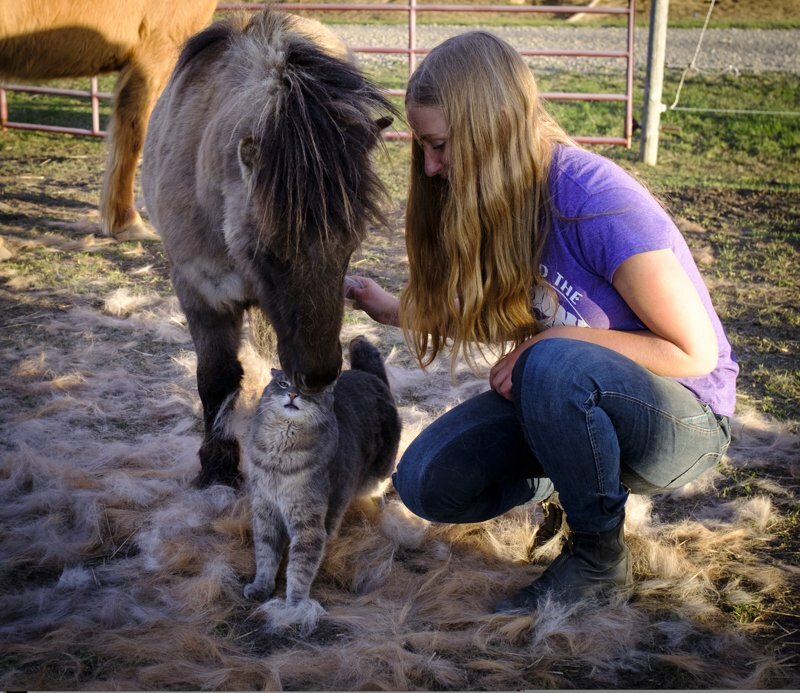 Integrating horses or other animals into a healing environment can help the human facilitator provide the conditions, as defined by Carl Rogers, required for therapeutic growth to arise: Genuineness, Empathy and Unconditional Regard. While this can greatly enhance the potential for effectiveness within an EFW program, it is important to note that it also creates an increased duty of care. I believe horses provide these conditions whether or not we recognise and value this. However we are much more likely to build upon and benefit from these conditions if we see and work with our animals as sentient beings. The presence of the horses can motivate someone to attend a therapy or other support session and accept help. We have had many clients who have not, for a wide variety of reasons, been willing or able to attend or engage in counselling elsewhere; coming to a place where there are animals is often different. The presence of animals can simply make it safe to show up – both physically and emotionally. The simple presence of the horses and other animals may well be enough to motivate a client to shown up physically; It takes an environment where the animals are valued and worked with as sentient beings, I believe, to create the safety for a client to show up and engage emotionally. This approach requires us to see and reflect upon our animals as having emotions, thoughts and opinions; in other words as sentient beings. Horses offer us lots of experiential opportunities to learn about and develop improved relationship skills including enhanced understanding of body language, non verbal communication and boundaries. We can certainly engage in, learn and benefit from experiential work with horses and other animals while viewing the animal as a tool. In these case we are exploring our own behaviour, emotions and thought processes in relationship with ourselves, the other people involved in the exercises, or our perception of some problem or situation we see the animal as representing in that moment. All valuable opportunities to learn and grow. Yet, if we view the animal as a sentient being, we open up so many more possibilities. Yes, the horse can provide us with a mirror, but he is also his own being, with his own emotions, thoughts, opinions and needs. Experiential work within this context provides the potential for richer, deeper and, I believe, more meaningful healing, learning and growth. 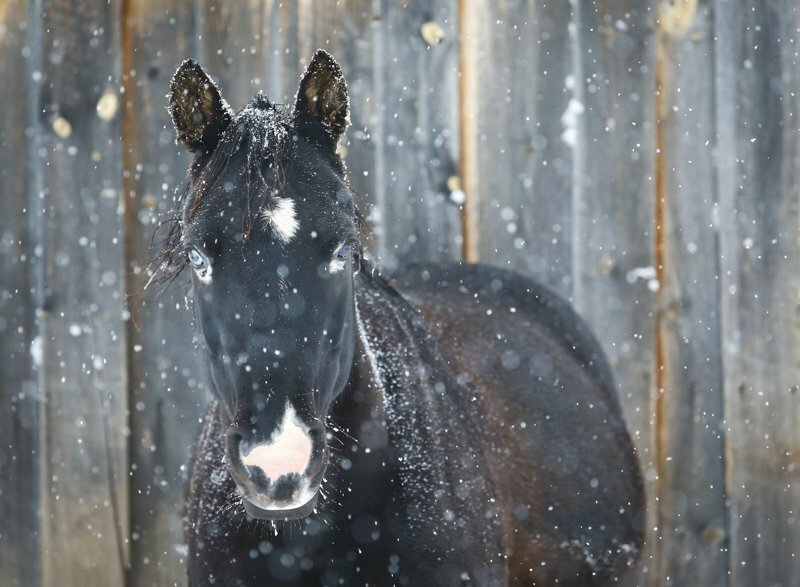 How does the “Horse as Sentient Being” view impact how we care for and treat our horses? The right for the horse to (safely) express discomfort, including emotional discomfort, preference, needs and opinions during and in between therapy sessions, without repercussion. The right for the horse to safely say no to an activity, to working with a particular person or population, and even to this career. 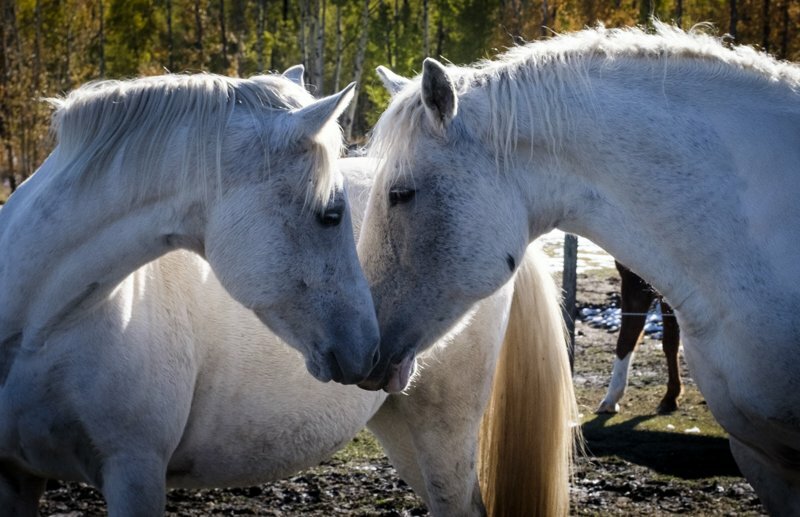 The horses’ need to relationships with other horses, adequate time off, and time with people they are not responsible for. The facilitators’ need to be able to read and respond to horses’ body language including signs of physical and emotional stress and calming signals. The importance of a healthy relationship between the therapy animals and the therapist. The need to emotionally support our animals during therapy sessions. The need to ‘debrief’ with our therapy animals after sessions, in ways which work for them. The need to screen, train and prepare our animals appropriately and adequately for this work. The right for the horse to retire or find a new job when this is needed. Understanding, monitoring and managing the therapy animals’ well being is something we explore in great depth at all of our training workshops. Just as ‘self care’ can look different for different people, in many cases what we need to look out for and do depends on the the individual needs of each animal. For more information on this topic now please refer to our earlier article on equine therapy ethics where we explore this from a case study perspective. Next Question in this series: Who Should I Certify With? What about you? If you have any questions you’d like us to answer in this series, or questions on any of the above material, please use the comments section below! “ While this can greatly enhance the potential for effectiveness within an EFW program, it is important to note that it also creates an increased duty of care.” I can actually see that forgetting about the increased duty of care animals need in therapy, can be so easily forgotten or second in concern when workering with clients. Reminding ourselves that we work with sentient beings is just so important to making sure that the increased care animals require is on the same level of importance as our clients welfare. This question definitely has me thinking about my start up and how I will balance the number of clients with the number of horses I have that are ready work in EFW programs. Awareness is so important in this regard. Awareness of the impact of the animal in different situations with different clients, and how the needs and care of the animals physical and emotional health is just as important as the clients. It’s not just “doing the work” but observing, being aware and learning from both the animal and the client. Love this so much. Just last week I was out with the horses and started sharing what I was seeing with one of our mares and her new foal. As I spoke I realize that what I was seeing was not perfect but almost a perfect mirror to a piece of my relationship with my kids…but mostly with my oldest daughter. I don’t think it’s coincidence the horses that we choose or that choose us. What a gift they are. I hope that this work we ask them to do heals them also and is not only a drain. Having owned horses for 20+ years I have a very personal understanding that horses (and all animals for that matter) are sentient beings. But it was actually a very traumatic life experience that gave me this unwavering understanding. When I was younger (probably around 13), I was in an accident with my now 27-year-old horse where we fell though some ice in a muskeg. I had only been riding for a couple years and did not know about the dangers of this area and pushed my horse against his better judgment to continue going forward. When we fell though the ice we were alone and quite far from home. When we fell though the ice, I slipped underneath him in the water but was able to grab hold of the saddle horn. When I got out of the water, I realized he was sinking and without intervention would not have made it. I was able to stabilize him long enough to run on foot to the nearest road and flag down numerous strangers and we were able to pull him out to safety. It took a long time and a lot of trust exercises for me to re-establish a trusting relationship with my horse after this incident. But today after this trauma and many many years together I can honestly say that I have partnership with my horse that I can’t even put into words other then to say he understands me (and I him) on level that does not compare to any human to human relationship I have. I whole heartedly believe that horses have so much more to offer then being a tool to “bring insight, learning and healing” but that they are truly “sentient beings who you partner with you to bring insight, growth and healing in the clients”. Thank you for sharing this experience with us Kerie. It sounds terrifying, but a wonderful example of how good things can, if we allow them, grow out of difficult and challenging situations. I totally agree that horses are sentient. I have experienced this as a child with my horse and experience this currently with our weanlings. Watching them play, assert dominance, look annoyed, etc. They are just a bunch of babies with their own emotions, preferences and personalities. 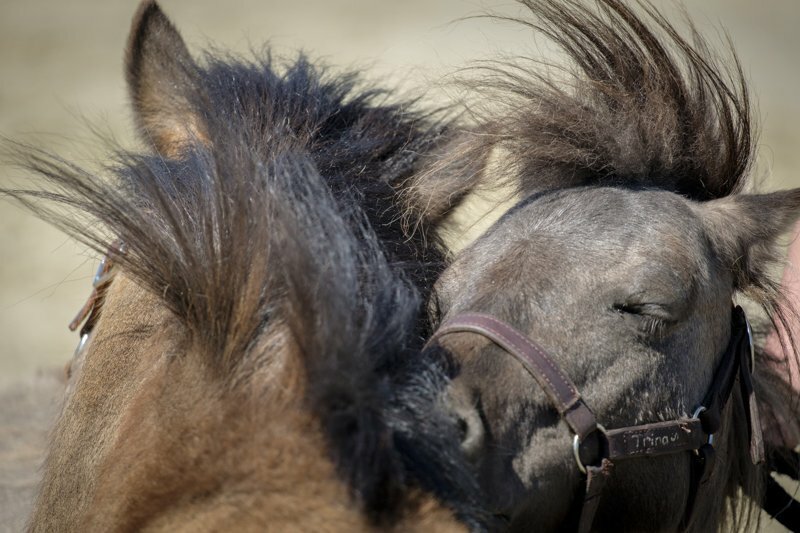 The care needs for horses are the same as human beings and vary from individual to individual in relation to emotion and physical connection, safety, etc. I think that this article reinforced how we naturally approach our horses. I think that people often fear anthropomorphizing their animals, and in the process tend to ignore their animals’ emotional states completely. Knowing that animals are sentient and have their own emotions and thoughts requires us to work harder at accurately interpreting their behaviours in any situation. Just like in our relationships with people, getting to know our animals’ quirks and needs takes work. Although this may be daunting, it ultimately leads to a richer more fulfilling relationship between people and their animal companions. I agree that horses/animals are sentient beings. They need to feel safe and assurance from us while they are ‘working’. It is amazing the healing energy that we can get from animals if we just slow down and listen and watch what is happening around us. I just wish my horse was still around to experience this journey with me. In his older (settled down) years he would have been amazing as my partner. I hear you Holly! When I started out Healing Hooves I still had my old guy who I’d had since (me) being a teenager. We lost him shortly after starting HH but all that he taught me is still part of me, and a big part of what I do in my work through other horses now. You may find it ends up being a little like this with you and your connection to your horse too. Great article. I feel that the “horse/animal as sentient being” approach is much more holistic for everyone involved. Acknowledging our animals individual personalities and limits is protective for the animal as well as our clients. This article makes me think how ignoring these limits could inflict more harm than good and place therapists in a ethically compromised position. The part of this article that I have spent the most time thinking about is that the animal (horse in my case) needs to have the same level of care as I need as a counsellor in terms of self-care. This is an extension of believing that the animal is a sentient being that I had not thought about. I guess that is similar to when I started counselling and I was unaware of the importance of self-care for me. Knowing of the importance of it for myself, and reading the information provided means I can start EFW work with an understanding of this for my horse and be mindful of my responsibility to provide that for him. Thank you. Wow! What a great article Sue. In my heart, I have always felt and known that animals/horses are sentient beings that have so much wisdom to offer us if we just open our hearts to them. Reading this article, has provided me with a newer appreciation for the way an animals/horses physical needs and wellbeing should be considered and understood; in order to manage and provide a more holistic equine therapeutic approach to Counselling. being your horses best advocate is fundamental as described here. Pet partners are saying YAYABA, you are your animal’s best advocate, my son is going over the pet partners program right now with his dog and I found lots of similarity with what I am trying to do with my horses. This is such an amazing article, I absolutely agree that animals are sentient. We can learn so much from observing and interacting with all different species of animals. I love that this article highlighted the animal’s rights as in considering them sentient beings. A lot of my research for school has focused on animals in healing environments, and how they can create a therapeutic alliance in having someone attend counseling, or show up for appointments, especially within mental health and addictions. There is some fascinating work for animals being the reason people make changes in their lives and I feel like this article perfectly captures that. I am excited to expand and learn more on this topic in the training! I loved this article as well! Each one of my horses has a different personality and you can tell by their actions that they have feelings. I always say my buckskin is the funny guy – he is the first to carry off your jacket – it seems he is always trying to get a laugh. Sometimes i see him doing things to the other horses to get them going as well. Just this week he reached over the fence and grabbed one of the ferriers files and tried to make off with it as my other horse was being worked on. My black horse is my healer, he is my Alpha horse, he takes care of the heard and makes you feel safe in his presence. My roan is my horse that brings out my fears. Each of these horses have been a huge part of my healing journey (I experienced the loss of my son in 2011) and i know they have felt my emotions right along with me. I want to make sure that they are well cared for as i most certainly feel as though we are in this together. This is such an important article and I look forward to learning more. I so resonate with the part of the article that states…” if we view the animal as a sentient being, we open up so many more possibilities. Yes, the horse can provide us with a mirror, but he is also his own being, with his own emotions, thoughts, opinions and needs. Experiential work within this context provides the potential for richer, deeper and, I believe, more meaningful healing, learning and growth”. I grew up with horses as a teenager – and although I had a deep love and bond with my horse, I don’t think I fully appreciated this and the true honor I had to be in the presence of my horse. I don’t have my own horse yet, but every time I have the opportunity to be with horses I feel such a deep appreciation and sacredness in the experience.